Support from Audubon of the Western Everglades helps 2nd and 5th grade classes from Collier County elementary schools participate in learning adventures with Audubon's Corkscrew Swamp Sanctuary. Books about insects, which are part of the 2nd grade curriculum and are geared to 2nd grade reading levels, are sent from Corkscrew to each participating elementary school two weeks prior to a field trip. An "Insect Adventure" at Corkscrew is the culminating activity where students hike trails and stop at learning stations to test their knowledge of insects. Similarly, books about Florida ecology and wildlife travel to 5th grade classrooms for two weeks and are followed by a "Wild Florida Adventure" field trip to the Sanctuary. The focus is on wildlife as well as hydrology and conservation. Audubon of the Western Everglades provides a grant to help fund The Panther Posse at Florida Gulf Coast University. The Panther Posse is one segment in FGCU's Wings of Hope program. It is an environmental education program where each semester, university students teach 4th and 5th grade elementary school students in Collier and Lee County about the Florida Panther, panther habitat, and about water conservation. 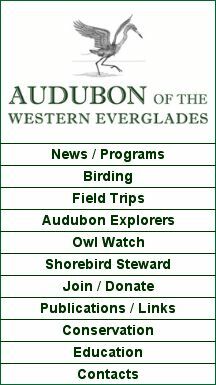 Audubon Explorers is sponsored by Audubon of the Western Eveglades and is in its seventh season. The club is for students between the ages of 7 to 15 and provides them with regular weekend field trips to various habitats in Southwest Florida. In addition to teaching about birding and providing opportunities for students to apply their knowledge in the field, the club introduces students to the importance of wildlife and wildlife conservation. For many club members, the field trips are their first ventures away from an urban/surburban environment. For more information, including a membership application, please click on the "Audubon Explorers" tab at the left.